With underfloor heating, airconditioning and room service – plus regular social media updates to their owners – the pets who stay at Calabash certainly receive a VIP experience. 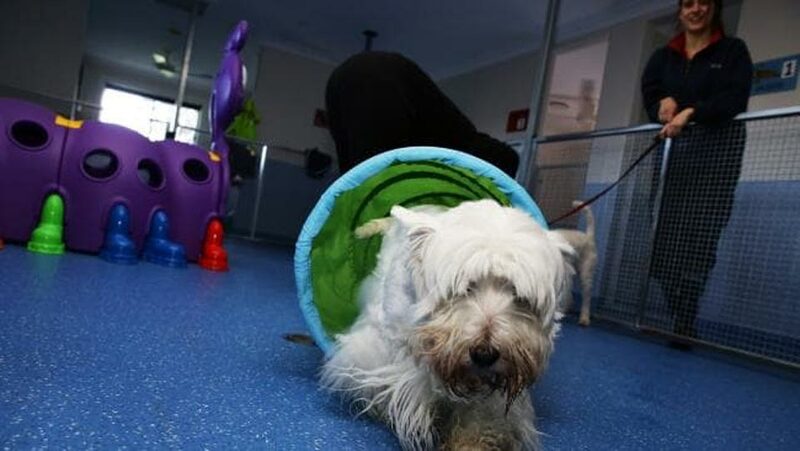 Calabash Kennels and Cattery in Arcadia recently opened the Canine Lodge, which offers small to medium sized pooches private outdoor areas, underfloor heating, air conditioning, room service and extra personal play time. Owner Linda Meumann said the Canine Lodge was “always a dream of mine”. “The little dogs just love it,” she said. The Lodge offers 20 suites with two dogs in each room or single rooms can be requested. Accommodation ranges from the Lassie Suites, with a bed and television to the Toto Suites, with private outdoor play area. Bobby tests out the play equipment. Daily treats, tummy rubs, basic grooming and scented baths complete the pampered experience. Owners can also rest assured, with staff posting regular updates about their “fur babies” on Facebook and Twitter. Dogs still receive a pampered experience in the regular kennels, with large, secure and supervised play areas, play groups and optional extras such as adventure walks, training, grooming, scent games and dam swims. Not to be forgotten, the cats who stay at Calabash can choose from The Garden Villas, with 24-hour access to a private outdoor area with tropical plants and balconies; The Balcony Suites, with spacious areas and sunny terraces; or the Garden View Rooms, with views over the jungle gym.